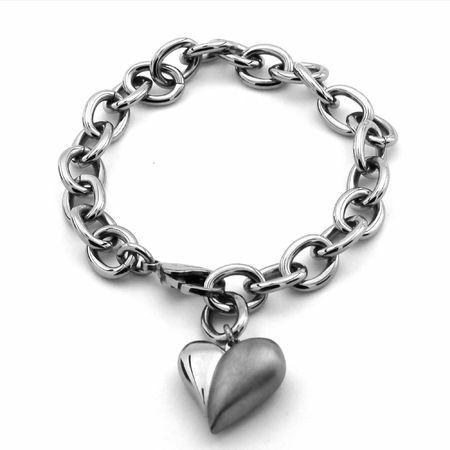 Similar in style to the classic Tiffany & Co sterling silver bracelet. This ladies titanium bracelet has a nice chunky look to it but is lightweight being made of titanium. The heart charm has a dual finish and measures about 3/4" wide by 1" long. Makes a great gift! 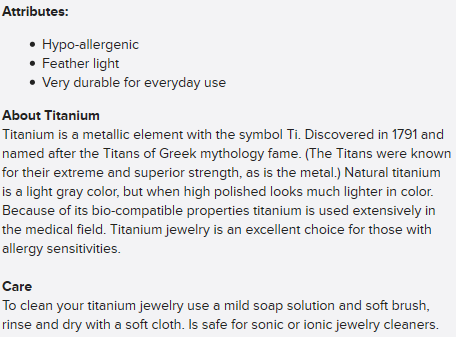 A benefit of titanium for your bracelet is that it is 100% hypo-allergenic. Your skin will not react to titanium. Some people are very sensitive to the nickel in white gold bracelets and other materials. No need to worry with this titanium bracelet. The color of titanium is gray. When it is high polished it looks lighter in color. When it has a satin finish (like 1/2 of the heart) it darkens. Note: Due to the thickness of the links this bracelet will fit tighter than most bracelets. You may want to order 1/2" longer than you normally would. Great gift that is within a good price range. comfort style and function, what else is there? I mentioned that the heart seems to break off, however I wear the bracelet 24/7. Titanium Jewelry warranties the items they sell and fixed the bracelet at no cost to me. I received the matching diamond heart necklace and bracelet from my son to remember him when I went to Africa to work with AIDs victums. I could wear the jewelry there and did not feel I was flaunting wealth as I served the destitute communities. I still wear the jewelry daily and think of my son whenever I touch the hearts! I have a special order ruby ring, another necklace and numerous earrings from Titanium Jewelry. They are distinctive, and I receive regular positive comments on the quality and appearance of the jewelry. The bracelet is very pretty and I am very happy that I ordered it! Due to the size of the links, however, the bracelet is much more snug than the length measurement would imply. My wrist measures 5.5 inches but the 6.5 inch bracelet barely fits. I'll be exchanging for a different size. Love how it looks on my wrist & how light it feels. I have searched everywhere for something like that & affordable. This bracelet fits my search. This is my 1st piece of Ti jewelry & I have no regrets purchasing it from this website. [...] Truly satisfied. Just received this today and it's really cute! Lightweight, comfortable and great for everyday wear. I was looking at a Tiffany charm bracelet but then saw this one and preferred the style, metal -- and price! My one complaint is the sizing -- it seems like the measurement includes the clasp itself for total length, so as another reviewer stated it is a bit small for the advertised length (I have a 7" tennis bracelet that is practically falling off me; this bracelet of the same size is significantly tighter.) I'm not sure if I'm going to try to size up. All in all happy with the purchase. Purchased the heart bracelet as an anniversary gift. Was attracted to it's classic style, while yet still light weight and durable enough for everyday wear. I wear my bracelet everyday. It's beautiful and someone very special chose it for me. The bracelet is lovely. The heart is just the right size. The bracelet is very lightweight , but durable. It's unique and not over-the -top. The only drawback is that the bracelet seems smaller than the advertised size.